One of the Hebrew words for "rain," applied mostly to the heavy rains which occur in Palestine in the fall and winter. This half of the year is called in the Mishnah "yemot ha-geshamin" (days of rains). 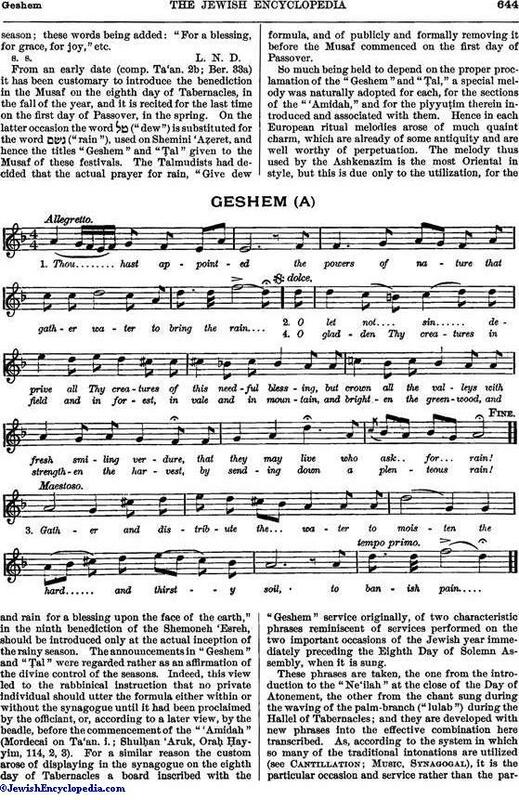 In the liturgy of the German-Polish ritual "Geshem" stands for the piyyuṭim which in the Musaf or additional service for the Eighth Festival Day (Shemini 'Aẓeret) are read and sung as an introduction to the first mention of the "powers of rain," i.e., the words "He causeth the wind to blow and the rain to descend." 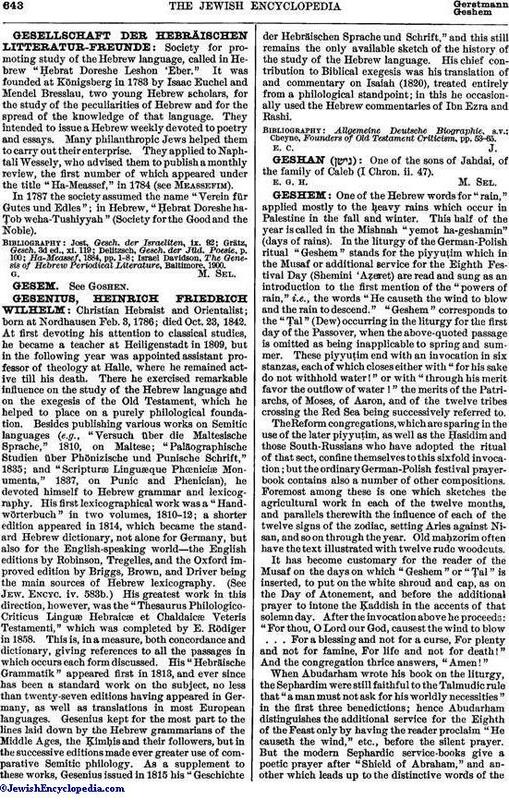 "Geshem" corresponds to the "Ṭal" (Dew) occurring in the liturgy for the first day of the Passover, when the above-quoted passage is omitted as being inapplicable to spring and summer. These piyyuṭim end with an invocation in six stanzas, each of which closes either with "for his sake do not withhold water!" or with "through his merit favor the outflow of water!" the merits of the Patriarchs, of Moses, of Aaron, and of the twelve tribes crossing the Red Sea being successively referred to. The Reform congregations, which are sparing in the use of the later piyyuṭim, as well as the Ḥasidim and those South-Russians who have adopted the ritual of that sect, confine themselves to this sixfold invocation; but the ordinary German-Polish festival prayer-book contains also a number of other compositions. Foremost among these is one which sketches the agricultural work in each of the twelve months, and parallels therewith the influence of each of the twelve signs of the zodiac, setting Aries against Nisan, and so on through the year. Old maḥzorim often have the text illustrated with twelve rude woodcuts. It has become customary for the reader of the Musaf on the days on which "Geshem" or "Ṭal" is inserted, to put on the white shroud and cap, as on the Day of Atonement, and before the additional prayer to intone the Ḳaddish in the accents of that solemn day. After the invocation above he proceeds: "For thou, O Lord our God, causest the wind to blow . . . For a blessing and not for a curse, For plenty and not for famine, For life and not for death!" And the congregation thrice answers, "Amen!" When Abudarham wrote his book on the liturgy, the Sephardim were still faithful to the Talmudic rule that "a man must not ask for his worldly necessities" in the first three benedictions; hence Abudarham distinguishes the additional service for the Eighth of the Feast only by having the reader proclaim "He causeth the wind," etc., before the silent prayer. But the modern Sephardic service-books give a poetic prayer after "Shield of Abraham," and another which leads up to the distinctive words of theseason; these words being added: "For a blessing, for grace, for joy," etc. From an early date (comp. Ta'an. 2b; Ber. 33a) it has been customary to introduce the benediction in the Musaf on the eighth day of Tabernacles, in the fall of the year, and it is recited for the last time on the first day of Passover, in the spring. On the latter occasion the word ("dew") is substituted for the word ("rain"), used on Shemini 'Aẓeret, and hence the titles "Geshem" and "Ṭal" given to the Musaf of these festivals. The Talmudists had decided that the actual prayer for rain, "Give dew and rain for a blessing upon the face of the earth," in the ninth benediction of the Shemoneh 'Esreh, should be introduced only at the actual inception of the rainy season. The announcements in "Geshem" and "Ṭal" were regarded rather as an affirmation of the divine control of the seasons. Indeed, this view led to the rabbinical instruction that no private individual should utter the formula either within or without the synagogue until it had been proclaimed by the officiant, or, according to a later view, by the beadle, before the commencement of the "'Amidah" (Mordecai on Ta'an. i.; Shulḥan 'Aruk, Oraḥ Ḥayyim, 114, 2, 3). For a similar reason the custom arose of displaying in the synagogue on the eighth day of Tabernacles a board inscribed with the formula, and of publicly and formally removing it before the Musaf commenced on the first day of Passover. So much being held to depend on the proper proclamation of the "Geshem" and "Ṭal," a special melody was naturally adopted for each, for the sections of the "'Amidah," and for the piyyuṭim therein introduced and associated with them. Hence in each European ritual melodies arose of much quaint charm, which are already of some antiquity and are well worthy of perpetuation. 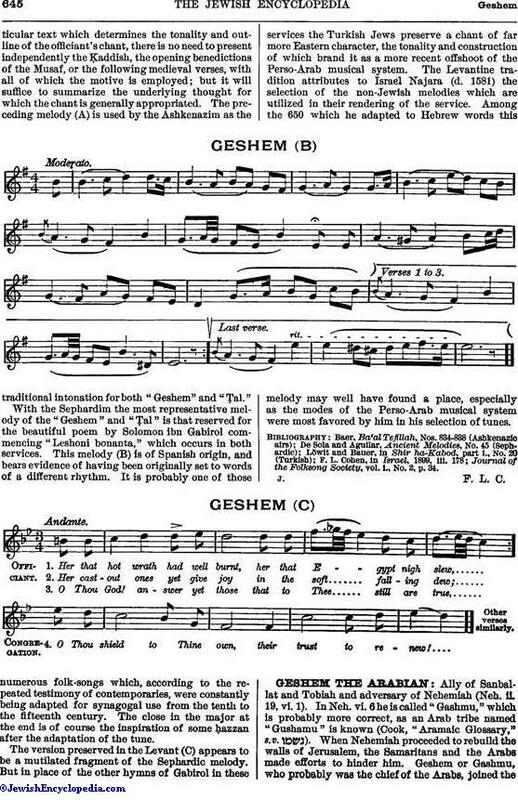 The melody thus used by the Ashkenazim is the most Oriental in style, but this is due only to the utilization, for the "Geshem" service originally, of two characteristic phrases reminiscent of services performed on the two important occasions of the Jewish year immediately preceding the Eighth Day of Solemn Assembly, when it is sung. These phrases are taken, the one from the introduction to the "Ne'ilah" at the close of the Day of Atonement, the other from the chant sung during the waving of the palm-branch ("lulab") during the Hallel of Tabernacles; and they are developed with new phrases into the effective combination here transcribed. As, according to the system in which so many of the traditional intonations are utilized (see Cantillation; Music, Synagogal), it is the particular occasion and service rather than the particulartext which determines the tonality and outline of the officiant's chant, there is no need to present independently the Ḳaddish, the opening benedictions of the Musaf, or the following medieval verses, with all of which the motive is employed; but it will suffice to summarize the underlying thought for which the chant is generally appropriated. The preceding melody (A) is used by the Ashkenazim as the traditional intonation for both "Geshem" and "Ṭal." With the Sephardim the most representative melody of the "Geshem" and "Ṭal" is that reserved for the beautiful poem by Solomon ibn Gabirol commencing "Leshoni bonanta," which occurs in both services. This melody (B) is of Spanish origin, and bears evidence of having been originally set to words of a different rhythm. 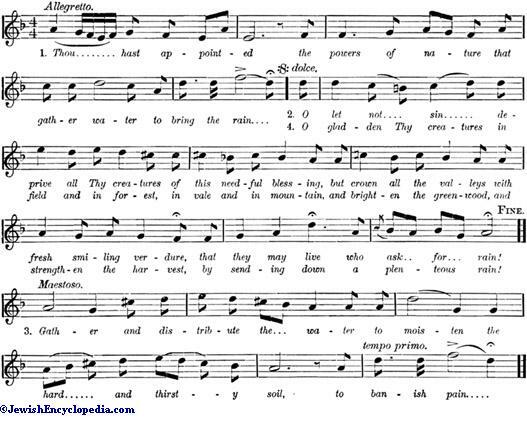 It is probably one of those numerous folk-songs which, according to the repeated testimony of contemporaries, were constantly being adapted for synagogal use from the tenth to the fifteenth century. The close in the major at the end is of course the inspiration of some ḥazzan after the adaptation of the tune. The version preserved in the Levant (C) appears to be a mutilated fragment of the Sephardic melody. But in place of the other hymns of Gabirol in these services the Turkish Jews preserve a chant of far more Eastern character, the tonality and construction of which brand it as a more recent offshoot of the Perso-Arab musical system. The Levantine tradition attributes to Israel Najara (d. 1581) the selection of the non-Jewish melodies which are utilized in their rendering of the service. Among the 650 which he adapted to Hebrew words this melody may well have found a place, especially as the modes of the Perso-Arab musical system were most favored by him in his selection of tunes. Journal of the Folksong Society, vol. i., No. 2, p. 34.